Continuing our countdown of the top 30 raid tier sets of all time, today we look at the Tier 1 priest set, known as the Vestments of Prophecy. This set, like all Tier 1 sets, was striking and something completely different and for that reason it holds a place on this list. 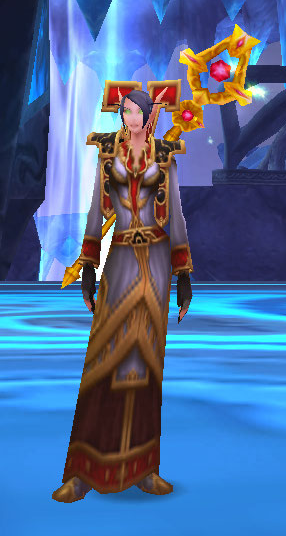 While the set may not hold sway with today’s Tier 11 and 12 sets, in this authors opinion it still has a very classic priest look and the headpiece would set a standard for future sets and even NPC/Boss models. Also take note of the staff in the picture below. This is one of the cooler weapons in the game (stats excluded of course) and is called Anathema. What was unique about this staff was its ability to transform between its dark form, Anathema and its light form, Benediction (shown). A truly epic weapon for its time but sadly obsolete today. This entry was posted on May 5, 2011 at 10:39 pm and is filed under General, MMO, Role Playing, World of Warcraft. You can follow any responses to this entry through the RSS 2.0 feed. You can leave a response, or trackback from your own site.